Not seen a stencil like this before, Julia. I love that you used purple and stencilled off the edge. The sequins are a lovely touch too. I really LOVE your card, Julia! Wilted Violet was the perfect choice for this beautiful girl and I love how you added the flower sequins! Such an elegant and creative debut! I'm so happy to be joining you on the team!!! You exceeded everyone's expectation, Julia! This is such a unique and interesting sponged image! 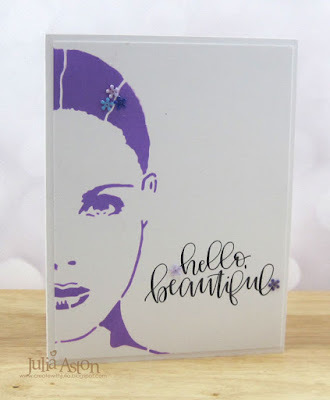 Love your choice of the stencil, the color, and the layout (using half of the face)! We miss you on the CMU DT, but I'm so happy to see you bloom more beautifully in this new challenge. I love the stencil and that you've only used part of the design. The colour looks amazing too. We miss you at CAS Mix Up but are happy you are still in the CAS Family, Julia! 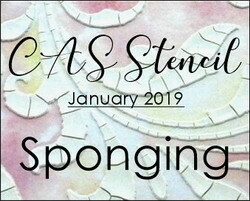 Love, love, love this stenciled image! And what a gorgeous font on that sentiment! It fits the image perfectly! I just love coming here...you are so inspiring mf. Love, love this amazing looking card, fresh and beautiful. This is so striking. It immediately draws your eye and it's so stunning. I love that you added flower sequins in her hair!